Parathyroid glands are four pea-sized glands located just behind the thyroid gland in the front of the neck. The function of parathyroid glands is to produce a hormone called parathyroid hormone (parathormone), which helps regulate calcium and phosphate in the body. Hyperparathyroidism is the overproduction of this hormone. Thyroid glands and parathyroid glands, despite their similar name and proximity, are entirely separate, and each produces hormones with different functions. Hyperparathyroidism may be primary or secondary. It most often occurs in those over age 30, and most commonly in patients 50 to 60 years old. It rarely occurs in children or the elderly. Women are affected by the disease up to three times more often than men. It is estimated that 28 of every 100,000 people in the United States will develop hyperparathyroidism each year. Normally, parathyroid glands produce the parathormone as calcium levels drop and lower to meet the demands of a growing skeleton, pregnancy, or lactation. However, when one or more parathyroid glands malfunctions, it can lead to overproduction of the hormone and elevated calcium level in the blood. Therefore, a common result of hyperparathyroidism is hypercalcemia, or an abnormally high level of calcium in the blood. Primary hyperparathyroidism occurs as a malfunction of one of the glands, usually as a result of a benign tumor, called adenoma. Secondary hyperparathyroidism occurs as the result of a metabolic abnormality outside the parathyroid glands, which causes a resistance to the function of the parathyroid hormones. Primary hyperparathyroidism is one of the most common endocrine disorders, led only by diabetes and hyperthyroidism. Often, there are no obvious symptoms or suspicion of hyperparathyroidism, and it is first diagnosed when a patient is discovered to be hypercalcemic during a routine blood chemistry profile. Patients may believe they have felt fine, but realize improvements in sleep, irritability, and memory following treatment. When symptoms are present, they may include development of gastric ulcers or pancreatitis because high calcium levels can cause inflammation and pain in the linings of the stomach and pancreas. Most of the symptoms of hyperparathyroidism are those present as a result of hypercalcemia, such as kidney stones, osteoporosis, or bone degradation resulting from the bones giving up calcium. Muscle weakness, central nervous system disturbances such as depression, psychomotor and personality disturbances, and rarely, even coma can occur. Patients may also experience heartburn, nausea, constipation, or abdominal pain. In secondary hyperparathyroidism, patients may show signs of calcium imbalance such as deformities of the long bones. Symptoms of the underlying disease may also be present. Most commonly, hyperparathyroidism occurs as the result of a single adenoma, or benign tumor, in one of the parathyroid glands. About 90% of all cases of hyperparathyroidism are caused by an adenoma. The tumors are seldom cancerous. They will grow to a much larger size than the parathyroid glands, often to the size of a walnut. Genetic disorders or multiple endocrine tumors can also cause a parathyroid gland to enlarge and oversecrete hormone. In 10% or fewer of patients with primary hyperparathyroidism, there is enlargement of all four parathyroid glands. This condition is called parathyroid hyperplasia. Diagnosis of hyperparathyroidism is most often made when a blood test (radioimmunoassay) reveals high levels of parathyroid hormone and calcium. A blood test that specifically measures the amount of parathyroid hormone has made diagnosis simpler. X-ray examinations may be performed to look for areas of diffuse bone demineralization, bone cysts, outer bone absorption and erosion of the long bones of the fingers and toes. Hypercalcemia is mild or intermittent in some patients, but is an excellent indicator of primary hyperparathyroidism. Dual energy x-ray absorptiometry (DEXA or DXA), a tool used to diagnose and measure osteoporosis, is used to show reduction in bone mass for primary hyperparathryroidism patients. Once a diagnosis of hyperparathyroidism is reached, the physician will probably order further tests to evaluate complications. For example, abdominal radiographs might reveal kidney stones. For secondary hyperparathyroidism, normal or slightly decreased calcium levels in the blood and variable phosphorous levels may be visible. Patient history of familial kidney disease or convulsive disorders may suggest a diagnosis of secondary hyperparathyroidism. Other tests may reveal a disease or disorder, which is causing the secondary hyperparathyroidism. Hyperparathyroidism cases will usually be referred to an endocrinologist, a physician specializing in hormonal problems, or a nephrologist, who specializes in kidney and mineral disorders. Patients with mild cases of hyperparathyroidism may not need immediate treatment if they have only slight elevations in blood calcium level and normal kidneys and bones. These patients should be regularly checked, probably as often as every six months, by physical examination and measurement of kidney function and calcium levels. A bone densitometry measurement should be performed every one or two years. After several years with no worsened symptoms, the length of time between exams may be increased. Patients with more advanced hyperparathyroidism will usually have all or half of the affected parathyroid gland or glands surgically removed. This surgery is relatively safe and effective. The primary risks are those associated with general anesthesia. There are some instances when the surgery can be performed with the patient under regional, or cervical block, anesthesia. Often studies such as ultrasonography prior to surgery help pinpoint the affected areas. Forcing fluids and reducing intake of calcium-rich foods can help decrease calcium levels prior to surgery or if surgery is not necessary. Removal of the enlarged parathyroid gland or glands cures the disease 95% of the time and relief of bone pain may occur in as few as three days. In up to 5% of patients undergoing surgery, chronically low calcium levels may result, and these patients will require calcium supplement or vitamin D treatment. Damage to the kidneys as a result of hyperparathyroidism is often irreversible. Prognosis is generally good, however complications of hyperparathyroidism such as osteoporosis, bone fractures, kidney stones, peptic ulcers, pancreatitis, and nervous system difficulties may worsen prognosis. Demineralization — A loss or decrease of minerals in the bones. Endocrine — Glands and hormone secretions in the body circulation. Phosphate — An organic compound necessary for mineralization of bone and other key cellular processes. Secondary hyperparathyroidism may be prevented by early treatment of the disease causing it. Early recognition and treatment of hyperparathyroidism may prevent hypercalcemia. Since the cause of primary hyperparathyroidism, or the adenoma which causes parathyroid enlargement, is largely unknown, there are not prescribed prevention methods. Osteoporosis and Related Bone Diseases—National Resource Center. 1150 17th S. NW, Ste. 500, Washington, DC 20036. (800) 624-2663. Paget Foundation. 200 Varick St., Ste. 1004. New York, NY 10014-4810. (800) 23-PAGET. abnormally increased activity of the parathyroid gland; it may be either primary or secondary. Primary hyperparathyroidism is associated with either neoplasia (chiefly adenomas) or hyperplasia; adenomas of the parathyroids account for about 85 per cent of all cases. Since hyperparathyroidism is a common cause of increased calcium levels, hypercalcemia discovered during routine serum chemistry profiles often leads to diagnosis of the condition. An excess of parathyroid hormone leads to alteration in the function of cells of bone, renal tubules, and gastrointestinal mucosa. It may result in kidney stones and calcium deposits in the renal tubules; in generalized decalcification of bone (osteomalacia), resulting in pain and tenderness of bones and spontaneous fractures, and in hypercalcemia that could lead to muscular weakness and gastrointestinal symptoms such as anorexia, nausea, vomiting, and abdominal pains. Secondary hyperparathyroidism develops as a compensatory mechanism when the serum calcium level is persistently below normal, as in chronic renal disease, vitamin D deficiency, or intestinal malabsorption syndromes, all of which can cause insufficient absorption of calcium and vitamin D.
The National Institutes of Health (NIH) Consensus Development Conference on Diagnosis and Management of Asymptomatic Primary Hyperparathyroidism addressed the diagnosis and management of the condition. Symptoms can be vague, and are most often related to elevated calcium levels; determinations of calcium and parathyroid hormone levels are required. The use of thiazide diuretics or lithium can elevate levels of both parathyroid hormone and calcium, so that the levels should be evaluated after discontinuation of these medications before a diagnosis is made. Imaging studies may be helpful in diagnosis of a parathyroid adenoma or determination of its location. Candidates for medical management of hyperparathyroidism can have a mildly elevated serum calcium level. There should be no history of life-threatening hypercalcemia, and renal and bone status should be normal. The patient should be monitored frequently for alterations in blood pressure, serum calcium and creatinine levels, creatinine clearance, urinary calcium, and bone density. Dehydration and immobilization should be avoided and diuretics should be used with caution. Dietary calcium should be neither liberalized nor restricted. Treatment of hypertension and replacement of estrogen in post-menopausal women are also recommended. Surgical treatment is indicated when parathyroid-related symptoms involve the skeletal, renal, or gastrointestinal systems. Other indications include markedly elevated serum calcium level (1 to 1.6 mg per dL [0.25 to 0.40 mmol per L] above accepted normal range); history of an episode of life-threatening hypercalcemia; reduced creatinine clearance (30% less than that expected); presence of kidney stones on radiograph with markedly elevated urinary calcium excretion (greater than 400 mg per 24 hours [10 mmol per day]); substantially reduced bone mass as determined by direct measurement (more than 2 standard deviations below that expected); significant neuromuscular or psychological symptoms without other obvious cause; request by the patient for surgery; anticipation of problems with follow-up; and coexistent illnesses that complicate management. The usual procedure is a subtotal parathyroidectomy that leaves some parathyroid tissue to continue normal endocrine function. Patient Care. Postoperative care includes careful monitoring of the patient for complications of hemorrhage, infection, hypoparathyroidism and hypocalcemia, and damage to the laryngeal nerve. When the patient returns from surgery, the operative site is assessed carefully. The side and back of the neck, as well as the anterior dressing, should be observed for any bleeding. The amount and other characteristics of drainage are noted and recorded, vital signs are monitored closely, and the patient is observed for signs of respiratory difficulty. Accumulations of subcutaneous fluid must be watched carefully as they can contribute to infection and tissue necrosis. Unless otherwise indicated, the patient is placed in the semi-Fowler position postoperatively. The rationale for this is that it makes breathing easier, promotes drainage from the operative site, and decreases pressure on the skin and suture line. At the time dressings are changed, wound drainage is noted. A milky drainage after feeding could indicate a chylous fistula, a rare complication resulting from injury to the thoracic duct during surgery or postoperative damage to and necrosis of adjacent tissues. Mild, transient hypoparathyroidism and resultant hypocalcemia occur in about 70 per cent of patients after parathyroidectomy, probably because the removal of parathyroid tissue demands readjustment of the body to the decreased production of parathyroid hormone, to the interrupted blood supply to the gland, and to any trauma to the parathyroid tissue left after surgery. Patients with transient postoperative hypoparathyroidism will exhibit symptoms of hypocalcemia and neuromuscular irritability. The patient should be monitored carefully for any signs of tetany. In addition to nervousness, hyperreflexia of tendons, convulsions, and prolonged Q-T interval on the electrocardiogram, the patient may present positive chvostek's and trousseau's signs. Laboratory data will show a serum calcium deficit. Intravenous calcium gluconate (10 per cent) is administered to counteract the hypocalcemia. If the condition persists and the patient can tolerate oral medication, the calcium can be given by mouth. Therapy is often needed for only a few weeks until the transient hypocalcemia is over; however, some level of hypocalcemia is considered desirable as it acts as a stimulant to the remaining parathyroid tissue. Metabolic consequences of hyperparathyroidism. PTH, parathyroid hormone. From Damjanov, 2000. A condition due to an increase in the secretion of the parathyroids, causing elevated serum calcium, decreased serum phosphorus, and increased excretion of both calcium and phosphorus, calcium stones and sometimes generalized osteitis fibrosa cystica. /hy·per·para·thy·roid·ism/ (-par″ah-thi´roid-izm) excessive activity of the parathyroid glands. Primary h. is associated with neoplasia or hyperplasia; the excess of parathyroid hormone leads to alteration in function of bone cells, renal tubules, and gastrointestinal mucosa. Secondary h. occurs when the serum calcium tends to fall below normal, as in chronic renal disease, etc. Tertiary h. refers to that due to a parathyroid adenoma arising from secondary hyperplasia caused by chronic renal failure. 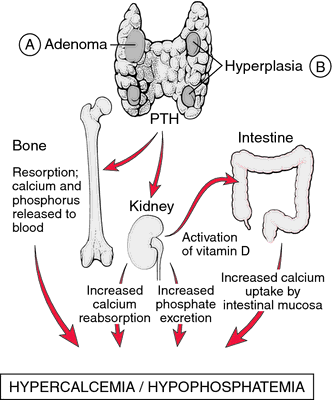 A condition in which the parathyroid glands secrete excess parathyroid hormone, causing resorption of calcified bone, elevated serum calcium, decreased serum phosphorus, and increased excretion of both calcium and phosphorus. an abnormal endocrine condition characterized by hyperactivity of any of the four parathyroid glands with excessive secretion of parathyroid hormone (PTH), which causes increased resorption of calcium from the skeletal system and increased absorption of calcium by the kidneys and GI system. The condition may be primary, originating in one or more of the parathyroid glands and usually caused by an adenoma, or secondary, resulting from an abnormal hypocalcemia-producing condition in another part of the body, which causes a compensatory hyperactivity of the parathyroid glands. observations Hypercalcemia in primary hyperparathyroidism results in dysfunction of many body systems. In the kidneys, tissue calcifies, calculi form, and renal failure may ensue. In addition, excess phosphorus is excreted, and excess 1,25 (OH)2 D (vitamin D) is synthesized. In the bones and joints, osteoporosis develops, causing pain and fragility; fractures, synovitis, and pseudogout often occur. In the GI tract, chronic, piercing epigastric pain may develop as a result of pancreatitis and increased gastrin production; anorexia and nausea may occur; and vomiting of blood may result if peptic ulceration occurs. In the neuromuscular system, generalized weakness and atrophy develop if the condition is not corrected, and changes in the central nervous system produce alteration of consciousness, coma, psychosis, abnormal behavior, and disturbances of personality. Secondary hyperparathyroidism may result in many of these signs of calcium imbalance and in various abnormalities of the long bones, such as rickets. The diagnosis of primary hyperparathyroidism is made by laboratory findings of increased levels of PTH and calcium in the blood and by the characteristic appearance of the bones on radiographic films. Calcium in the blood and urine and chloride and alkaline phosphatase in the blood are present in excessive amounts; phosphorus is present in the serum in less than normal amounts. interventions Primary parathyroidism that is the result of an adenoma of one of the glands is treated by excision of the tumor; other causes of primary disease may require excision of up to one half of the glandular tissue. In asymptomatic patients over 50, noninterventional observation may be indicated. Dietary intake of calcium may be limited, and adequate hydration must be maintained. Estrogens may be used in postmenopausal females. Bisphosphates may be administered in severe hypercalcemia to lower the serum calcium level. After surgery, calcium levels in the blood may drop rapidly to dangerously low levels if frequent laboratory evaluations are not made and supplemental calcium is not given as required. Secondary hyperparathyroidism is managed by treating the underlying cause of hypertrophy of the gland. Vitamin D is frequently given, and peritoneal dialysis may be necessary to remove excess calcium from the circulation. nursing considerations Frequent laboratory evaluations of blood levels of calcium, phosphorus, potassium, and magnesium are necessary throughout the course of treatment. Because fractures occur easily and are common, great care is taken to prevent trauma to the patient. IV hydration is usually performed to dilute the concentration of calcium, and the lungs are assessed regularly to detect pulmonary edema in its earliest stages. Tetany is a warning sign of severe hypoglycemia; calcium gluconate is kept available for immediate use after surgery. Walking and moving about cause pain but accelerate healing of the affected bones and are therefore encouraged. Endocrinology Parathyroid hypersecretion, which causes several relatively specific clinical complexes: myopathic syndrome, skeletal syndrome, urologic syndrome, CNS syndrome, in addition to a characteristic peptic ulcer, hypercalcemia and acute pancreatitis. See Hypercalcemia, Parathyroid gland, PTH, Secondary hyperparathyroidism. A condition due to an increase in the secretion of the parathyroids, causing elevated serum calcium, decreased serum phosphorus, and increased excretion of both calcium and phosphorus, calcium stones, and sometimes generalized osteitis fibrosa cystica. The result of excessive output of hormone from the PARATHYROID GLANDS that control deposition of calcium and phosphorus in the bones. The over-production is usually due to a tumour of the hormone-producing cells. There is OSTEOPOROSIS and excessive deposition of calcium in the soft tissues of the body such as the joint cartilages, tendons and muscles. Condition due to increased secretion of parathyroids, causing elevated serum calcium, decreased serum phosphorus, and increased excretion of both calcium and phosphorus, calcium stones, and sometimes generalized osteitis fibrosa cystica. 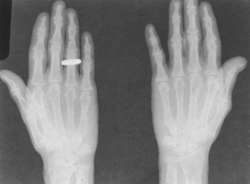 generalized osteitis fibrosa cystica or von Recklinghausen's disease. Brown tumors, which are essentially giant cell tumors, may develop generally, as well as in the jaws. Kidney changes include renal stones and nephrocalcinosis. Calcification of muscles in arteries occurs. Renal rickets is associated with secondary hyperparathyroidism in children with chronic renal disease. Laboratory findings include a high serum calcium level, low phosphorus level, and a normal or high alkaline phosphatase level. Renal impairment, such as occurs in secondary hyperparathyroidism, tends to nullify hypercalcemia because of an increased loss of calcium in the urine. n 2. an abnormal increase in activity of the parathyroid glands, causing loss of calcium from the bones and resulting in tenderness in bones, spontaneous fractures, muscular weakness, and osteitis fibrosa. 3. excessive production of parathormone by the parathyroid gland (as in parathyroid hyperplasia and/or adenoma), resulting in increased renal excretion of phosphorus by lowering of the renal threshold for this substance. The pathologic changes produced are osteoporotic or osteodystrophic in nature as a consequence of withdrawal of calcium and phosphorus from osseous tissues. n See node, brown, of hyperparathyroidism. abnormally increased activity of the parathyroid gland. Primary hyperparathyroidism is associated with either neoplasia (chiefly adenomas) or hyperplasia. An excess of parathyroid hormone leads to resorption of bone, increased resorption of calcium and increased excretion of phosphorus by the renal tubules, and increased absorption of calcium by the gastrointestinal mucosa. It may result in kidney stones and calcium deposits in the renal tubules; in generalized decalcification of bone (osteoporosis), resulting in pain and tenderness of bones and spontaneous fractures; and in hypercalcemia, leading to muscular weakness and gastrointestinal signs. Secondary hyperparathyroidism develops as a compensatory mechanism when the serum calcium level is persistently below normal or serum phosphorus is elevated, as in chronic renal disease, insufficient calcium or excessive phosphorus in the diet, vitamin D deficiency, low-level soluble oxalate intoxication in horses, and intestinal malabsorption syndromes causing insufficient absorption of calcium and vitamin D.
a disease of horses, pigs, goats, dogs, cats, and rarely cattle. It is most commonly caused by an excessive dietary intake of phosphorus in the absence of adequate calcium, which in horses is likely to be the result of a diet mainly of grain and in dogs and cats one predominantly of meat, but it may also result from other dietary causes of secondary hyperparathyroidism. In most species there is swelling of the maxillae and mandibles which is most marked in horses, loosening of teeth, shifting lameness, and particularly in dogs and cats, weight-bearing skeletal deformities (angel wings) and folding or compression fractures. Called also miller's disease, bran disease, bighead, Siamese cat disease, paper-bone disease. caused by chronic renal dysfunction, mostly in dogs, sometimes in cats, in which there is a secondary hyperparathyroidism, caused by the retention of phosphates. There is demineralization of bones, particularly the maxillae and mandibles, with loosening of teeth and facial swelling. Clinical signs are often overshadowed by the effects of the renal failure. Called also rubber jaw, renal rickets, renal osteitis fibrosa. While no ectopic thyroid tissue along with parathyroid adenoma is described in medical literature, there are reports of comorbidity of hyperparathyroidism and thyroid hemiagenesis. Primary hyperparathyroidism and coexisting hyperthyroidism - review of the literature. Spontaneous short-term remission of primary hyperparathyroidism from infarction of a parathyroid adenoma. 10,11 In this study, we evaluated the effects of two methods for thyroid cystectomy on the immune function of patients with primary hyperparathyroidism. Parathyroidectomy was performed for better control of the secondary hyperparathyroidism but the surgery was performed after the metastatic pulmonary calcifications had resolved. Hyperparathyroidism may be primary, secondary, or tertiary. Granell, "Primary hyperparathyroidism and acute pancreatitis," Endocrinologia y Nutricion, vol. The differential diagnosis between primary and secondary hyperparathyroidism was made in our case; we note that secondary hyperparathyroidism was excluded because of the important serum hypercalcaemia (in secondary hyperparathyroidism the calcium level is normal or low), low phosphorus level, very high value of PTH. Key clinical point: Supplemental vitamin D helps maintain normal bone levels in patients with primary hyperparathyroidism. Primary hyperparathyroidism is a rare cause of both acute and chronic pancreatitis. Primary hyperparathyroidism (pHPT) is a disease characterized by idiopathic, pathological hyper functioning of one or more parathyroid glands, leading to excessive parathyroid hormone (PTH) secretion .